Here at All-In-One Dental in Dublin, we know that having a smile you’re proud of is important. We provide high-quality care to make sure you get the smile of your dreams. How Can We Help You Replace Several Teeth? Large and very noticeable gaps are formed when someone has multiple teeth missing in a row, and it can be very noticeable when the teeth are in the front. People who have large gaps from missing teeth in a row can feel very unconfident about showing off their smile. The team at All-In-One Dental works with patients daily to fix their smile and to fix the problem of multiple teeth missing. If you live in California in Pleasanton, Dublin or San Ramon and are not happy with your smile, then you should book an appointment with Dr. Huang at All-In-One Dental. At All-In-One Dental, Dr. James Huang and his team provide an extensive assortment of practical and cosmetic dental services that will help improve your oral health and smile concurrently. 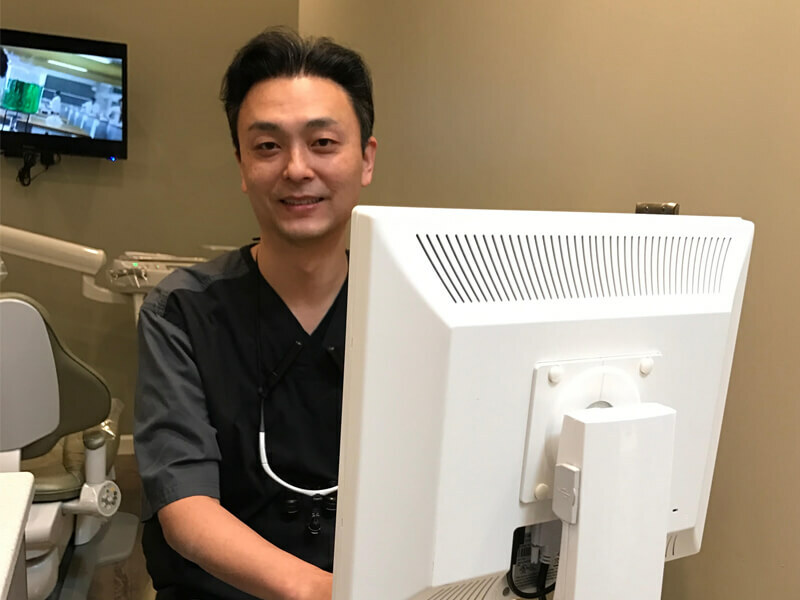 One of Dr. Huang’s specialties is pain-free dentistry, meaning that every procedure he performs are done as painlessly as he can do. Everyone at All-In-One Dental and Dr. Huang knows that patients have to love their new smiles and that a patient’s oral health is extremely important. Schedule a consultation with All-In-One Dental Innovations today by requesting an appointment online or giving us a call at (925) 828-9811. Why Should You Think About Getting Multiple Teeth Replaced? For patients, there are many reasons why they think about going to the dentist to replace missing teeth. One of the main reasons is the appearance of your teeth. When someone has multiple teeth missing in a row it creates a large gap vs. just having one tooth missing. Anytime a person smiles, they become aware of the gap and will do anything to minimize their smile or avoid smiling completely to prevent showing their teeth. Besides lack of confidence in your smile, there are other reasons that you need to think about getting your missing teeth replaced. One issue that can arise if you have one or more missing teeth is that your teeth fall out of alignment. This might not be an issue right now, but the longer you put off replacing your missing tooth or teeth it could develop. Getting your teeth alignment fixed is a longer and more expensive procedure than replacing teeth. Fix the appearance of your smile. What are the Different Ways to Have Multiple Teeth Replaced? One of the most popular ways to fix multiple teeth missing in a row is bridges. 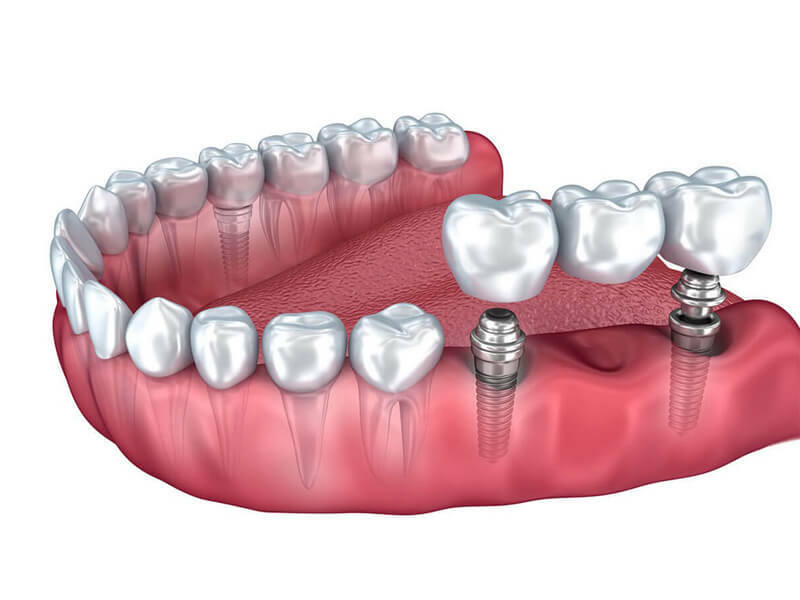 Implant supported bridges are different than a regular bridge because they use a dental implant to support it. The implant usually is surgically attached to the jawbone, and the bridge is attached to the top of the implant. 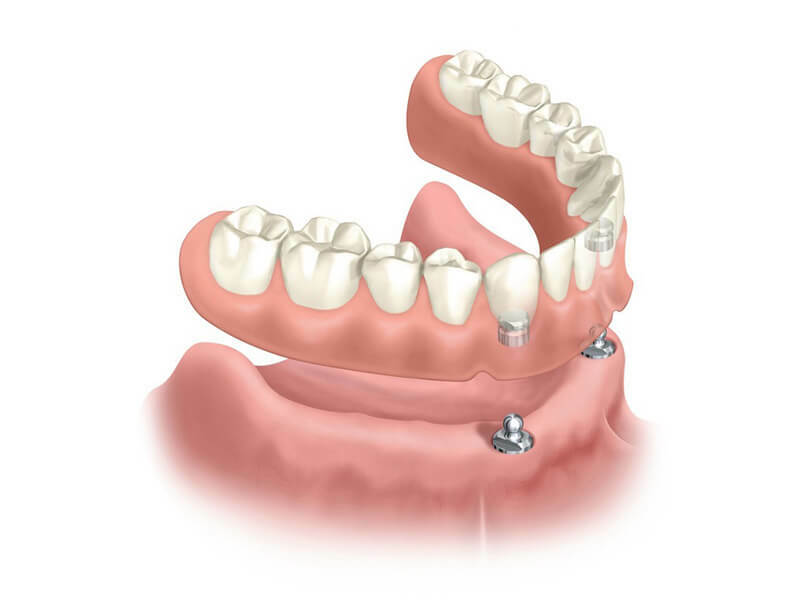 Getting an implant supported bridge is viewed as a permanent solution, but they are a bit more expensive than normal bridges. The most popular way for patients to solve having multiple teeth missing in a row is a denture, and they are one of the most cost-effective methods. 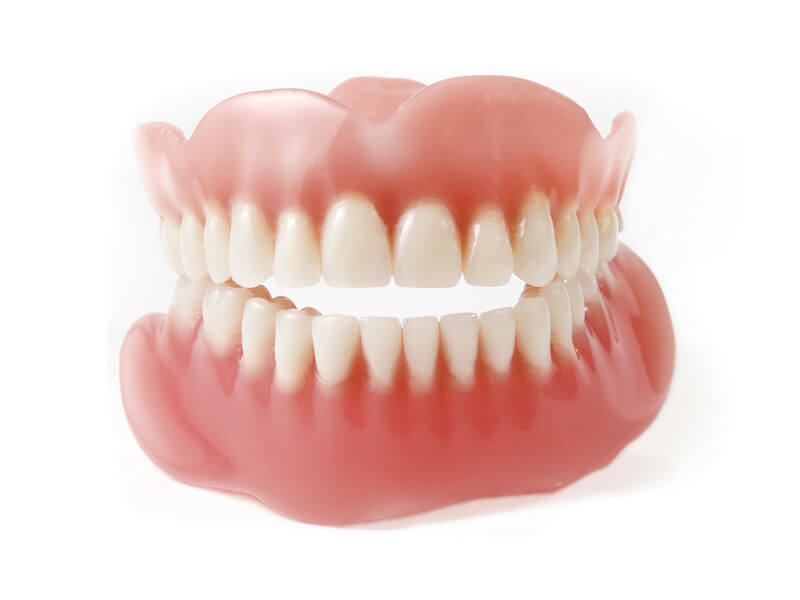 Dentures use the surrounding teeth as the anchors, and they have a manmade plate that sits behind the teeth. Full or partial sets of dentures are removable. They are kept in place with glue or an adhesive. A disadvantage of dentures is the worry that they will fall out while you’re eating or at an unfortunate time. However, most insurance companies cover dentures, so patients pick them for this reason. The standard for replacing a full set of teeth is the all-on-4 implants. This is a permanent solution, and it will not fall out because four implants are fixed to the jawbone to support it. Also, all-on-4 implants do not add to bone loss because they do not sit immediately on the gum line. 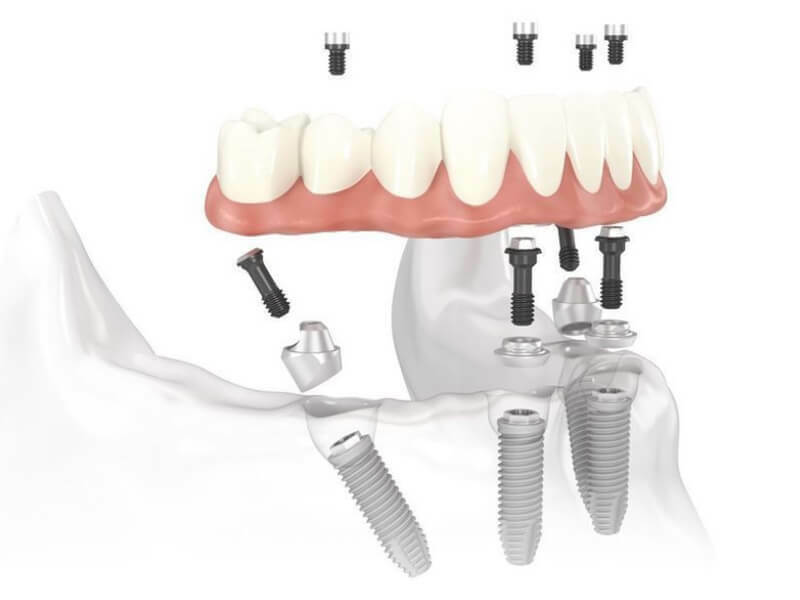 A lot of patients who have used dentures in the past will upgrade to all-on-4 implants for a more permanent solution that they do not have to worry about falling out. Even though all-on-4 implants are more expensive than dentures, patients do not need to worry about being replaced and help reduce the chances of bone loss. An implant-supported denture is similar to an implant-supported bridge because it uses implants as support. Dentures can replace four missing teeth in a row and additional missing teeth on the other side of a person’s mouth. They can be secured or removable, however, for most cases, patients want them to be fixed because they remove the fear of them falling out while eating or during an inopportune time. These are four great options for solving the problem of missing multiple teeth in a row. We will work with you to make sure that you pick the best one for you and your lifestyle. Get the Smile You’ve Dreamed of Today! At All-In-One Dental, we want you to have the smile of your dreams. We know that having a gap from missing teeth can make people feel less confident or upset, but also know that it can cause other issues. Besides problems related to dental health, multiple missing teeth can also lead to speech and sometimes eating problems. These problems can be solved by replacing your missing teeth. The team at All-In-One Dental can solve these problems, and give you back your life. Imagine what it would be like not having to worry about the gap in your teeth or being able to eat anything that you want to. Getting your missing teeth replaced will allow you to do all of these things, and you will love your smile. We want all of our patients to experience an improvement in their quality of life through pain-free and high-quality dental services. We want to make sure that everyone loves their smile, and for those who do not, we are determined to help you find the best solution for your budget and needs. There are options for how to solve replacing multiple teeth in a row. Schedule a consultation today with our knowledgeable and dedicated team to help you find the best solution for your dental needs. If you live in the Dublin, California area and want to replace your multiple missing teeth, then you should schedule a consultation with the team at All-In-One Dental. Booking a consultation is the best way to learn about the different options for replacing multiple missing teeth in a row. Our team will give you the best recommendation for you. Book an appointment by filling out the new patient form below or calling our office at (925) 828-9811.